- We can also supply Stone Table Tops in various sizes and specifications to fulfill individual customer requirements. We are engaged in offering a quality approved range of Silver Metal Inlay. 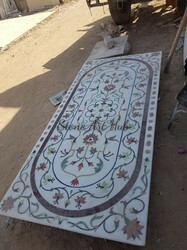 We offer an exclusive range of Exotic Floor Design In Inlay Work Table Tops On at unmatched quality and market leading prices. They are manufactured using advance and latest techniques. 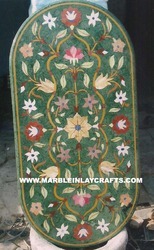 Marble Coffee, Tea, Dinning table top malachite Inlay Real Stone Designer Work.